IHG® Rewards Club - eBook - O Great One! Rather than explain the power of recognition in a typical business book, acclaimed CEO David Novak wrote a fun story that draws on his real-world experiences at Pepsi and Yum! Brands, as well as his personal life.When was the last time you told your colleagues how much you value them? It sounds like a trivial thing in the middle of a busy work day. But as Novak discovered during his years as a har… d charging executive, there's nothing trivial about recognition. It can make a life-or-death difference to any organization, when people see that someone important really notices and appreciates their contributions. The story of O Great One! opens when Jeff Johnson becomes the third-generation CEO of his family business, after the sudden death of his father. The Happy Face Toy Company had many hits in the 1950s and 60s, including Crazy Paste, but its results have been declining for more than a decade. The board has given Jeff just one year to turn the business around, or else they'll have to sell it to the highest bidder. As Jeff races to save his family's legacy by getting the company back on track, he meets downtrodden factory workers and an uninspired executive team. Then a birthday gift from his grandson gives Jeff an important insight into why Happy Face lost its culture of innovation and excitement, along with its profitability. 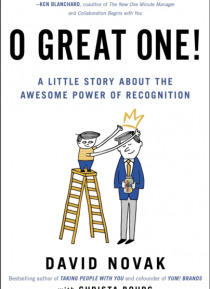 He comes up with an idea that seems crazy But is it crazy enough to work?Whether you're trying to lead a small department, a Fortune 500 company, a non-profit, or your own family, the story and lessons of O Great One! can help you make everyone around you happier and more effective.